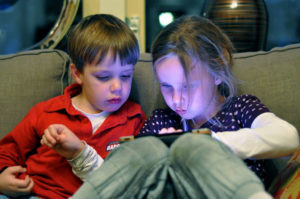 26 Jan Is too much screen time ruining your children’s health? How often do you find yourself with a group of young children and see almost everyone playing on their tablets or mobile phones? Game designers are continuously using a variety of techniques to make them more addictive and attractive. Have you ever worried about the adverse health impact of screen time and radiation from use of these devices? There is substantial research showing how too much screen time and internet use in children is linked to obesity, sleep disorders, anxiety, depression, autism, ADHD and other chronic disease. In a recent study, researchers found that children who reported spending more time on screen devices and watching television engaged in behaviours that can lead to Obesity. First, screen addiction means children have less time for healthier habits; they spend most of the screen time sitting down and huddled together. I have often seen children in the playground sitting down with their friends playing on their smartphone or tablet. This means less time for outdoor games, movement and normal things children do. Less physical activity means higher risk of obesity and other disease like diabetes. Children also spend plenty of time on screen on their own, which deprives them of the social interaction and results in isolation and anxiety as they grow up. Constant distraction from WhatsApp messages, texts, Emails, Instagram means young adults and children have reduced attention span and find it hard to focus on any one thing. The light from our devices has a higher concentration of blue light than natural light, which affects levels of the sleep-inducing hormone melatonin more than any other wavelength of light. Changes in sleep patterns can disturb the body’s natural clock, known as its circadian rhythm. Research has shown that shifts in circadian clock can cause devastating health effects due to their impact on body’s systems. So besides a lack of concentration, disruption of circadian clocks can have much bigger impact on your child’s health. Sleep deprivation can also lead to mood disorders and negatively impact the endocrine and immune systems. Yes, sleep deprivation can also result in insulin resistance and diabetes mellitus. Electromagnetic fields (EMF) are energy or electrical fields that span our entire environment and interact with biological and physical energy fields. Wireless networks, mobile phones, smart devices and remotes produce Radio Frequency EMFs (RF-EMFs) and these can have substantial impact on both the central nervous system and the peripheral nervous system. The International Journal of Oncology recently published a case-control study that confirmed “an association between mobile and cordless phone use and malignant brain tumors” and supported “the hypothesis that RF-EMFs play a role both in the initiation and promotion stages of carcinogenesis.” With the ubiquity of communication devices and wireless networks, children’s exposure to RF-EMFs has been increasing exponentially. Pregnancy, infancy and childhood are critical times for EMF exposure as higher rates of cellular differentiation and organ development occurs at this time. The Pediatric Endocrinology Reviews argued, “there are unignorable amounts of studies indicating the increased risk of cancer, hematologic effects and cognitive impairment” from EMF exposure. A growing number of studies have shown impacts on metabolism and endocrine function, reproductive system and growth, thyroid functions, adrenal hormones, glucose homeostasis and melatonin levels. A European study found evidence of linkage between childhood leukemia and EMF exposure and recommends more research. Recently, there has been an alarming increase in autism (ASD) with one in 80 families having a child suffering from it. Herbert and Sage, 2012 summarise and discuss a number of studies showing physiological processes and impaired behaviors in people with ASDs closely resemble those related to biological and health effects of EMF/RFR exposure. Fetal (in-utero) and early childhood exposures to cell phone radiation and wireless technologies in general may be a risk factor for hyperactivity, learning disorders and behavioral problems in school. Children’s nervous systems are still developing and, therefore, more vulnerable to detrimental effects of EMF exposure. As Dr Devra Davis discusses, their heads are smaller than those of adults and consequently have a greater proportional exposure to the field of radio frequency radiation that is emitted by cell phones. As debate rages between technology enthusiasts and skeptics on effects of EMF radiation, only time will present more evidence on the toxic impact of EMF exposure due to wireless and screen use. Meanwhile, it will be prudent to take precautions and minimising lengthy exposure, especially among pregnant women and children. Remember it too us a long time to recognise the dangers of asbestos and tobacco smoking as well. A number of schools around the world have already taken action against the wireless technology. Just imagine what your childhood was like without the distractions of modern technology. When children spend less time on screen, they have more time for other fun activities like playing a sport or talking to their friends/ parents. Besides the obvious health benefits, there has been tremendous amount of research showing positive correlation between sports and growth mindset in children. Sports also fosters positive attributes like problem solving, discipline and grit. It also keeps their immune systems healthy, meaning they get sick less often. 1. First, limit the amount of screen time per day at home to the minimum possible. One strategy I have used is to limit screen time for playing games to 20 minutes on weekend. Reinforce healthy habits and active lifestyles in free time during which young ones can incorporate physical activity. 2. Don’t use devices in the bedroom, take the TV, computers out of your children’s bedroom. Children who have TVs in their room spend almost one and a half hours more each day watching them than their peers. 3. The temptation is huge but don’t make screen time as a reward for good behaviour, thus signifying its importance. Find and use more meaningful ways to increase good, healthy behaviour. 4. Use dinner times to engage with your kids in conversation about their day or other things and do not fall to the temptation of using smartphones, tablets or TV at that time. 5. Don’t allow use of technology at least for 2 hours before bedtime. 6. Take a technology free vacation where the focus is on spending time together as a family and disconnecting from technology and screens. 7. Find activities your kids love and do them together as a family. When you find an activity you enjoy as a family together, you’d have much more fun doing it together than sit alone in front of a screen. Just don’t make that activity Pokémon GO. 8. Limit exposure to EMF with shielding devices. Modern lifestyle requires children to use their laptops, tablets and wireless for school and other activities. Limit the exposure to radiation by using exposure shielding devices that reduce harmful EMF radiation to virtually undetectable levels. 9. Switch off the wi-fi when not needed, and definitely at night. 10. Use a good wifi blocker to prevent interference from other networks in your house. Those of us who live in condominiums or other high density neighbourhoods get wifi radiation from our neighbours all the time. I would love to hear from you about what strategies you use to limit use of screen time and technology at home. What are your favorite ways to disconnect? Email or post your comments below or on my Facebook page. If you think others might benefit from this article, please share it on social media.